Custom Protect Ear (CPE) reaches out to a struggling family in Phnom-Penh to provide a home for the family of six to live in. Through the humanitarian organization of World Housing with their mission of “A home for everyone”, CPE Chairman, Jeffrey Goldberg and President Howard Raphael at CPE contributed $5,000.00 to build the home that now provides security and stability for Sam and his family. Sam, his wife and 4 children moved from their village to Phnom-Penh so the children could have access to education. Selling coconuts and then cane juice to earn a living did not provide enough income for a home. Unable to pay rent they slept at the Pagoda. Now with a place for their children to sleep protected from mosquitoes and a place for them to study, Sam’s dreams for a better life for his family are beginning to unfold. World Housing helps provide homes for families living in slums around the world. In the city of Phnom Penh, Cambodia in just 2 short years more than 360 homes housing more than 1800 people have been built for families in need. With help from Private and Corporate funding like CPE, World Housing is able to provide homes for these impoverished families. CPE through their dB Cares Foundation helps causes and charities. 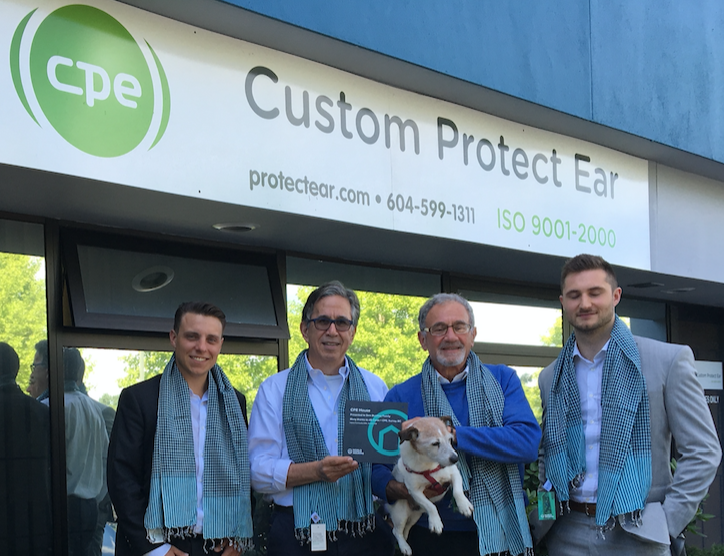 Graham Brewster and Alex Holme of World Housing presents a “Thank You” plaque to Howard Raphael and Jeffrey Goldberg of Custom Protect Ear (CPE) while wearing scarves that were made in Cambodia by people in the community of the housing project.